﻿ Monalysa Villa Pulau Mauritius. JIMAT di Agoda.com! Ada soalan mengenai Monalysa Villa? Sesuai untuk berehat dan bersantai, Monalysa Villa terletak di area Grand Baie di Pulau Mauritius. Hanya 01 Km dari pusat bandar, lokasi strategik hotel memastikan tetamu boleh ke mana-mana sahaja dengan cepat dan mudah ke tempat-tempat tarikan. Untuk pilihan bersiar-siar dan tempat daya tarikan tempatan, pelancong tidak perlu pergi jauh dari hotel kerana ianya berdekatan dengan Sportfisher, MauriTours, Ebrahim Travel & Tours. Monalysa Villa menawarkan perkhidmatan yang sempurna dan semua kemudahan penting untuk menceriakan pelancong. Fasiliti tetamu kurang upaya, tempat letak kereta, pengangkutan lapangan terbang, bilik keluarga, lawatan merupakan beberapa kemudahan yang membezakan Monalysa Villa daripada hotel-hotel lain di bandar. Tetamu boleh memilih dari 3 bilik, semuanya yang akan memberikan suasana ketenangan dan keharmonian. Sepanjang hari anda boleh menikmati suasana yang santai dengan taman. Temui gabungan yang menarik antara perkhidmatan profesional dan pelbagai kemudahan yang ada di Monalysa Villa. Pelanggan Monalysa tidak dibenarkan menjemput tetamu luar untuk bermalam sepanjang tempoh menginap. Great location: 1 min walk to big supermkt, resto, exchange place. It might b a little noisy at night since it's on the major rd but it's not a big problem. They also cleaned the apt daily- definitely good stay! Had a great 5 day stay at Monalysa Villa. Very centrally located in Grand Baie, literally 5 minute walk to supermarket, restaurants, shopping and the beach. 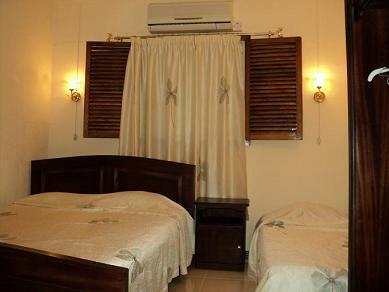 Rooms are clean, equipped with everything you need to self cater but basic. Wi-Fi is included, off street parking available. Monalysa tours which operates from the same property is a full service travel agent offering good value tours which were professionally run. Car rental also available on site. We utilized most of the services/tours offered (and a oddball request which Eric and his team went out of the way to also accommodate - THANKS) and everything was VERY well priced but not lacking at all in quality. We had a great stay and recommend anyone looking to find clean, central, self contained accommodation run by a friendly team to try Monalysa Villas and Monalysa Tours. It was a pretty decent stay, keeping in mind that this was a studio apartment with Kitchen, I would not like to compare this with the regular hotels. But what I would definitely compare is studio apartments in other places where I stayed. Everything is fine, but one needs to provide atleast basic necessities even if it is a studio apartment and you expect the travellers to do their own job like, having a washing machine or providing basic toilet or kitchen consumables. Ensuring that every day the room gets cleaned by a cleaner etc. etc. This all items were clearly missing. I would not recommend to people who are interested in leisure and relaxation here as everything has to be done as you do at your home and doesnt give a feeling of a holiday itself. Abbiamo passato 8 gg. in questa struttura e ci simo trovati molto bene!!! Consigliatissimo!! !